This square table is decorated with horned archaic dragons confronting each other along the cusped aprons. This style of dragon carving suggests a dating from the late Ming period. The legs are constructed from a deeper and darker colored huanghuali. 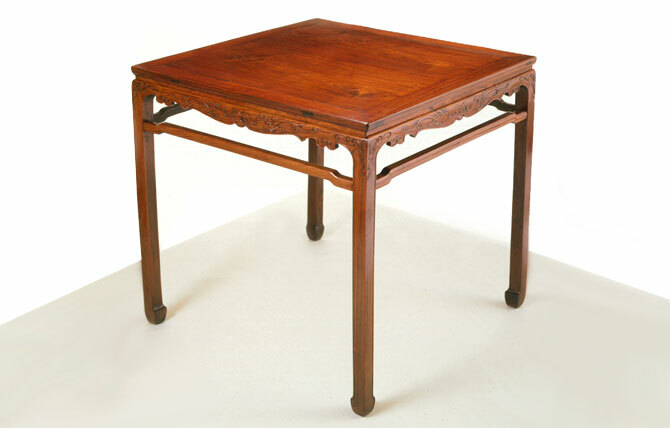 The roundness of the humpbacked stretchers, the smooth edges of the carving, and the style of horse-hoof feet give this table a refined appearance. A waisted square table of this style and design is illustrated in Robert Ellsworth’s Chinese Furniture, Plate 75. This table has no dragon carving, but the side aprons have similarly cusped curves. On pages 164 to 168 of Ming Furniture In The Light of Chinese Architecture, Dr. Sarah Handler writes as follows: “In Jin ping mei (The Plum in the Golden Vase), square tables are referred to by the intriguing name ‘eight immortals tables’, or baxian zhuo, and are shown with six, four, or two people seated around them. Today Beijing furniture makers and dealers use the terms ‘eight immortals table’, ‘six immortals table’, and ‘four immortals table’ to distinguish between the different sizes…Square tables were not only used for meals but also for playing chess (weiqi) and other board games.